The Immortal Meeting. 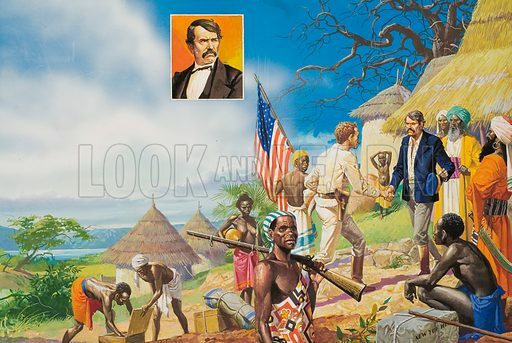 After years of isolation in the wilderness of Central Africa, David Livingstone whose disappearance had attracted the attention of the whole world, was finally tracked down by Henry Stanley. Uttering the famous words, "Dr. Livingtone, I presume? ", Stanley approached the legendary Livingstone. Despite Stanley's urgings, the Scottish explorer refused to leave Africa; soon he would press on in an attempt to discover the source of the Nile. Original artwork used for illustration on pp9-10 of Look and Learn issue non 873 (7 October 1978). Available worldwide for immediate download up to 4,888 x 3,273 pixels.